We have always had an Advent calendar in this house (even before we had kids), but my kids LOVE them so the tradition has grown a little bigger each year. This year might be maxing on the most we should do, but I guess you never know! Anyway, thought you guys would like to see the 5 Advent calendars we do every morning in December. 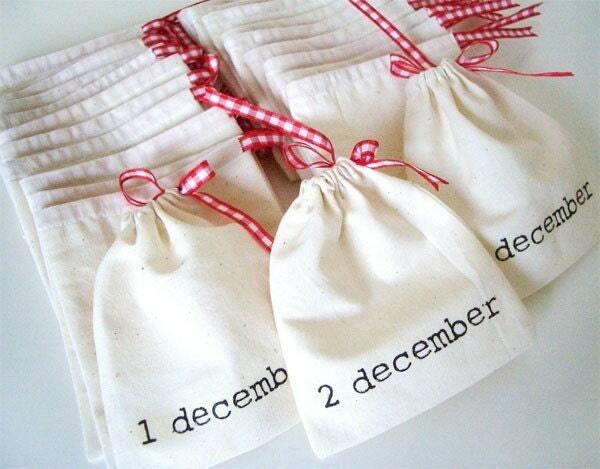 First we have our gift Advent calendar. The lovely Cathy & Gary (parents of my good friend Julie) send the kids a calendar every year and Jack has ALWAYS loved it (both the mail addressed to him and the calendar itself), so they keep doing it! This year it is this super cool gingerbread house that is also acting as our dining room table centerpiece. Super cute and keeps the kids busy while they wait for me to bring out their plates (they spend so much time looking for the next numbers and talking about what the mouse will be baking in the next window). 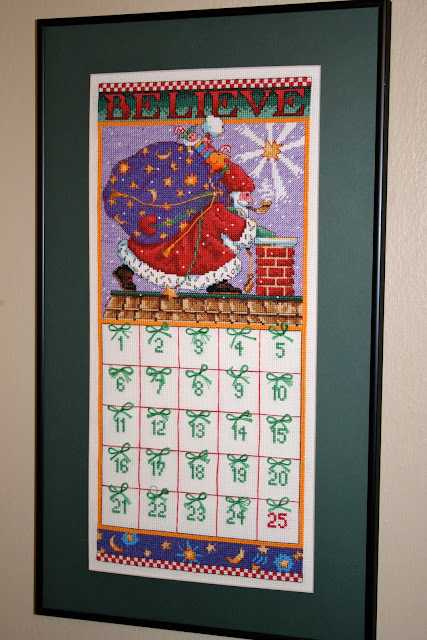 This is a counted cross-stitch number I made 8000 years ago (and I cut the mat it is in too)...we hang a little stitched charm on top of the number of the day. Most of the charms are just random toys, but we have special ones we save for certain days (a mitten for the first snowfall, gingerbread man for baking day, and a star for Christmas Eve). 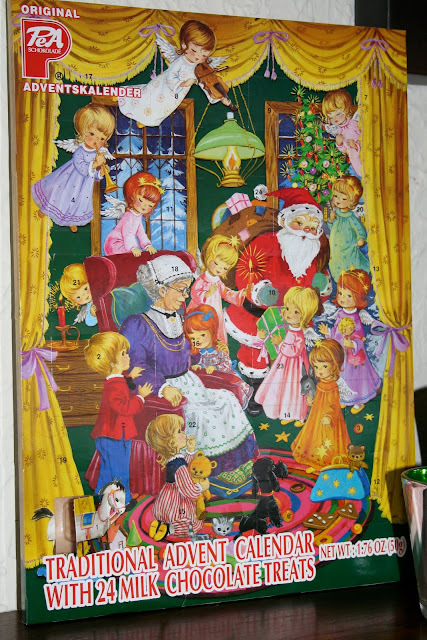 And this year I gave in and bought the traditional Advent calendar with the chocolate behind the windows. Trouble is this one has really good chocolate in it and my kids won't share! Hmmpf! So those are the main ones, but this year I wanted to add some new Advent calendars to the mix. 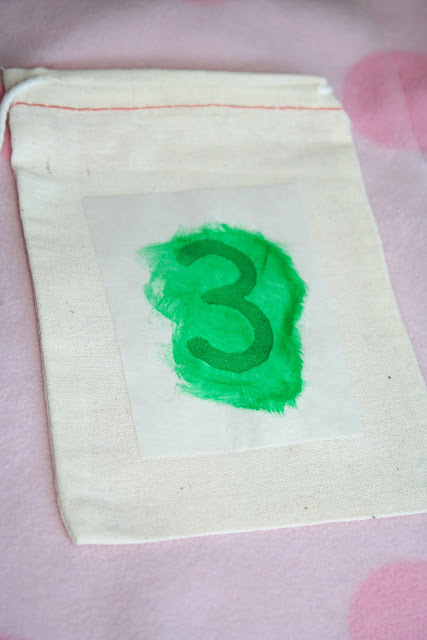 When Jack was younger we would do a countdown calendar where he crossed off the days to Christmas. Oh just found a pic...easy, easy, easy! Jack always like being involved (and still does), so when I saw this project, I figured it would be something we could do together and that it would be easy and cute! I mean look at this...so cute! I had cut out all the strips and was waiting to assemble the tree with Jack over the weekend, when I saw Tracie tweet that she was writing down Bible verses for their Advent calendar. Well, what could be more perfect than to add verses to the inside of the loops so each day when we take a loop off, we can read the verse and talk about it together. Luckily for me, she is a kind friend who happily (well, at least as far as I know) shared her picks with me (she even wrote them out for me in her email)...thank you Tracie! Is there a "when crafts go bad" site like Cake Wrecks and Regretsy? This could be on their hall of shame! Jack and I were cracking up when we made this!! Honestly!!!! 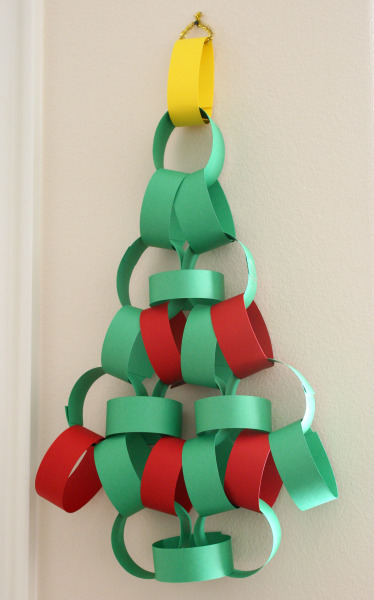 Here's the thing...nowhere on the blog did it say what size to make the loops. But let me just tell you 2x10" is not it! I'm thinking a longer, thinner piece of paper would do the trick...we'll find out next year I guess because I do really love this idea. But please remind me to experiment more before I attempt this again!!! And finally our last Advent calendar is the whole reason this post was held up (wouldn't it have been nice to show our calendars before Advent actually began? )...the process took awhile! See in September I saw these and was completely smitten. So I decided I had to make my own! Well 3 months later and I still hadn't even thought about how to get started! I had complete luck finding the bags (Emily sent me to this site to find something else and while I was there I bumped into these). Then in addition to seeing basic how to's elsewhere, a certain person posted detailed instructions on how to use freezer paper stencils. I was good to go! and wait for them to dry. 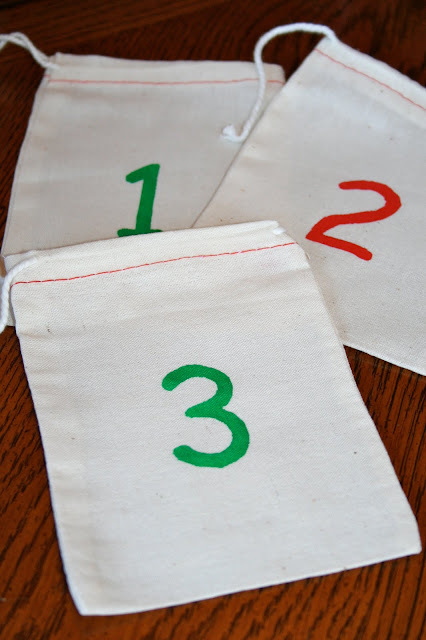 Then you peel your stencil off and voila...cool Advent calendar bags! They actually came out better than I expected, but nothing like the original inspiration bags. Here they are hanging next to the scary tree calendar...I'm thinking before I use them again next year, I'll pull the string out and add a ribbon in it's place. I also need to develop a better display system! Each bag contains a candy for each of the big kids (and yes, the candy is coming out of their Halloween baskets because they are still overflowing) and a piece of paper listing something we will do that day. Some are simple (build a fire, bake cookies, read Christmas books), some are things that were already on the calendar (ring bells, visit Santa, birthday party for Jesus, pj symphony) and some are special things that I wanted to be sure we did this year (ice skating, big kid date with Mom & Dad, drive to look at the lights downtown)...but all will be wonderful! 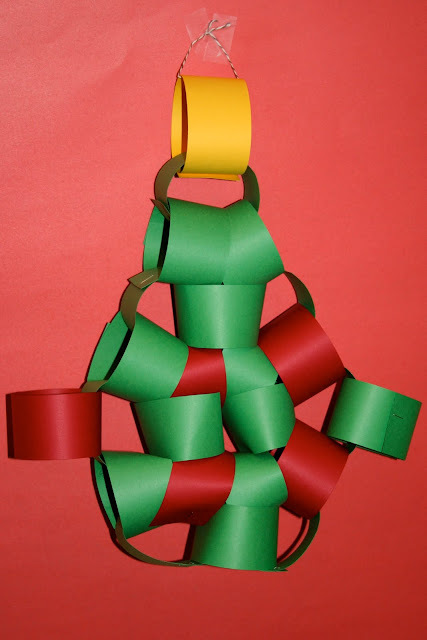 Taking a second look at yourchain tree, you definitely made the loops to wide. Otherwise, you did it just like the other tree but your loops had nowhere to go.